The Boston Globe plant on Morrissey Boulevard in Dorchester (1958-2017). These are the final hours of the Boston Globe building’s 59-year-old life as a printing plant and news operation. The last of billions of newspapers have rolled off the four-story-high presses. Green trucks weighed down by broadsheets no longer wheel onto Morrissey Boulevard from the loading dock. 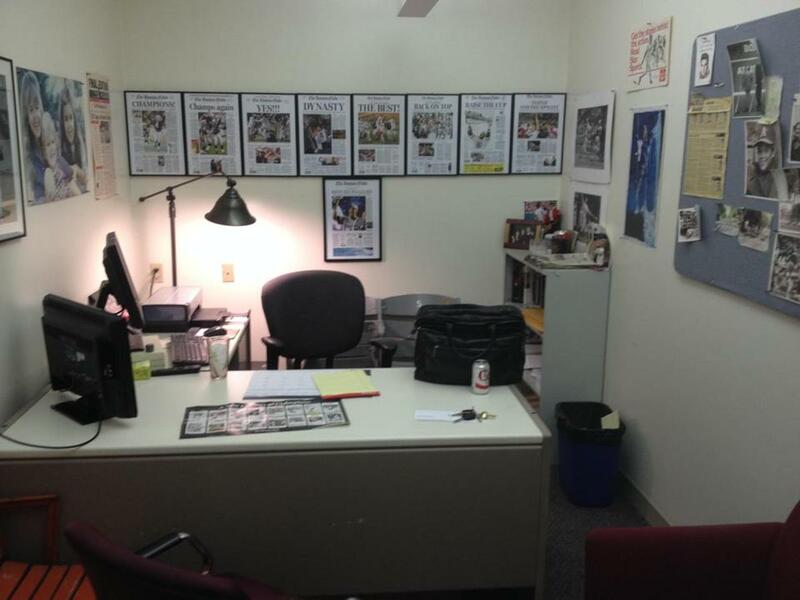 After midnight Thursday, nocturnal folks of the city room and sports desk will turn out the lights for good. 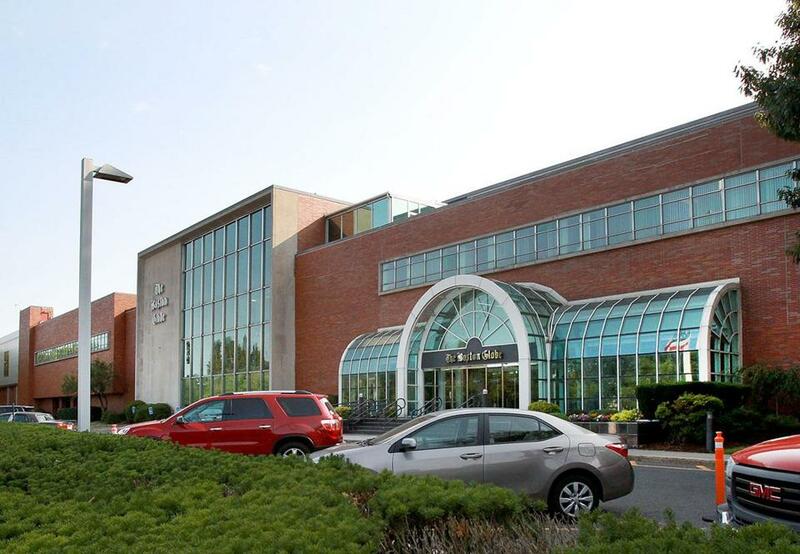 Here in the summer of 2017, the Globe is printed in Taunton, and its executive and editorial offices are moving to a gleaming new downtown space on the second and third floors of 53 State Street. Not me. I plan to occupy my grimy, windowless office round the clock — like those South Shore church parishioners — until the wrecking ball arrives. I am not an agent of change and find it unbearable to leave a sacred space where so many things happened. Serious journalists and news historians will wax poetic about the truly important work and prize-winning investigations that were part of the giant Globe campus (we had a barber shop, a tailor, a post office, a medical department, a gym, a travel agent, a dry cleaning service, a credit union, and a 24-hour cafeteria on our 16½ acres) since 1958. The Globe won 26 Pulitzer Prizes in this place. The author’s soon-to-be-abandoned office on Morrissey Boulevard. I can only tell you a little of what went on here in the toy department. This is where Jerry Nason, Ernie Roberts, Fran Rosa, Dave Smith, Vince Doria, Don Skwar, and Joe Sullivan assembled the best sports staff in America (we love hyperbole in sports, but it’s true) and chronicled the rich history of Boston sports. In our days on Morrissey Boulevard, we took New England sports fans from Ted Williams to David Ortiz, from Bill Russell to Thursday’s NBA Draft. This is where Bob Ryan and Peter Gammons started on the same day, June 10, 1968, and where they invented the modern Sunday notes columns, while reinventing the way professional team beats were covered. This is where Leigh Montville smoked a million cigarettes (everybody smoked in the old days; my current office used to be a smoking lounge) and sat side by side with Ray Fitzgerald, giving the Globe a Ruth-Gehrig combo of columnists in the 1970s. This is where 22-year-old Stan Grossfeld served as a courier in the frenzied minutes after Carlton Fisk clanged his home run off the foul pole in October of 1975. Standing on Yawkey Way, Grossfeld made a basket catch of Tom Landers’s undeveloped film tossed from Fenway’s roof, then pinballed his ’69 Chevy Nova through the clogged streets of Boston and got it to the Globe darkroom in time for the next morning’s paper. Less than a decade later, Grossfeld’s fellow photographers hoisted him on their shoulders and carried him into a reception on the Globe’s third floor in honor of his first Pulitzer. This is where I reported to the Globe’s automotive pool every night in the summers of 1974, ’75, and ’76 to cover the Boston Neighborhood Basketball League. Each night I would be issued a company Dodge Dart and sent to one of the city playgrounds. The cars had an official “Boston Globe” logo on the driver’s door, and in my travels I learned that folks in Dorchester, Charlestown, South Boston, and Mattapan were not fans of the Globe during the first days of court-ordered school desegregation. This is where the men (they were all men in those days) on the night sports desk, armed with red crayons and glue pots, edited typewritten scrolls and shipped the copy downstairs to the composing room in vacuum-sealed pneumatic tubes. The desk guys claimed every night was the “worst . . . night . . . ever!” and sang a special song whenever the Silver Lake High School football score came in on Saturdays. To the tune of “Oh, Tannenbaum,’’ the desk’s version closed with, “Oh, Silver Lake . . . you take the cake!’’ They thought it was hilarious and we always laughed as if it were the first time we heard it. This is where a young David Stern — then lieutenant to NBA commissioner Larry O’Brien — met with a Globe NBA investigative team in the Globe’s executive dining room in 1982. We were preparing a doomsday series on the future of the NBA, and Stern was dispatched to answer our questions and defend the league. This is where I sat at a desk opposite Will McDonough and often answered his alternate phone line while Willie was busy talking to Pete Rozelle or O.J. Simpson. I spent so much time small-talking with Al Davis that the Raiders owner actually offered me a job. This is where I sat in the crossfire when Willie got mad one day and challenged editor Matt Storin to “step outside.’’ Ryan has a distinct memory of Willie ending a phone call with Billy Sullivan by telling the Patriots owner he looked forward to whizzing on his grave. This is where I got in a helicopter on the Globe rooftop with photographer John Tlumacki because we were in a hurry to cover the death of baseball commissioner Bart Giamatti in 1989. Giamatti died on Martha’s Vineyard on Friday of Labor Day weekend, and sports editor Skwar wanted us there. So with no toothbrushes and a bunch of $20 bills from the Globe payroll department, we got in the chopper and flew over the holiday traffic before touching down gently in Vineyard Haven. I can’t remember many professional athletes walking through the front door of the Globe. Warren Spahn had a Globe tour with Neil Singelais in the 1970s, and Russell came to have lunch with us in the early days of the 21st century. Hundreds of high school stars came to the Globe to have their photos taken for our All-Scholastic sections. True. And this was the best office. Ultimately, of course, our space was never the place for the stars or the competition. The games took place at Fenway and the Garden and in Foxborough and at Harvard and Boston College and Braintree High School. That’s where the sports history was made. We were just here to tell you about it. This was our batting cage. This was our dugout. One-thirty-five Morrissey Boulevard was our clubhouse.